If you already have clients registered on your WordPress site, for example from another Project Management plugin, you will not be able to add them again in Projectopia as their email address will already be registered to a WordPress User. To get around this, Projectopia provides a client conversion tool which converts existing WordPress users to Projectopia Clients. To access the tool, go in to the WordPress Users page and hover over the user that you want to convert to a Projectopia Client. You’ll see a set of action links. 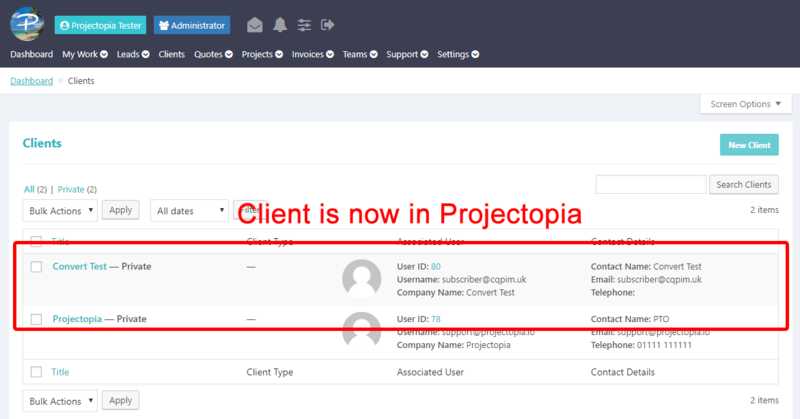 Click “Convert to CQPIM Client” and the selected user will be converted to a Client in Projectopia. TIP: The action links will only appear for users who have roles that are not already related to Projectopia or WordPress Admin. For example, if a user is a WordPress admin then they cannot be converted, but if they have the Subscriber role then they can.